This was more or less a spur of the moment trip, I made a quick hotel reservation, booked a bus ticket, and the next morning headed up to the Fuji Five Lakes area for some quality 'away from Tokyo' time. The first time I came here (May of this year) I only stayed for a day and I didn't have time to see and do everything I wanted, so I decided to come back, this time in the winter. My hope was that there would be snow on the hiking trails, and few people to disturb me. I only got one of my wishes though as the only snow to be seen was on the top of Mt. 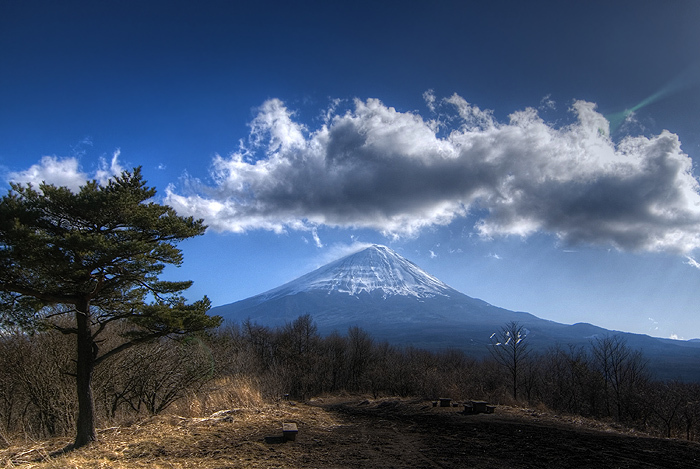 Fuji in the distance. Having two days gave me more options, and the first thing I did when I arrived was head to the most remote of the 5 lakes, lake Motosu. A couple of reasons for this, first of all, 'remote' generally equals 'good' in my opinion as the farther out you go, the less chance you'll have of running into cheesy tourist contrivances like snack stands, souvenir shops and what have you. Secondly the view of Mt. Fuji from the north side of the lake is the view you can see on the current 1000 yen bill, which you can compare from the above and below pictures if you happen to have one on you at the moment. Unfortunately I have no control over the clouds or the roughness of the lake, so it's not an exact replica, but you get the idea. For some reason I just wanted to see this view for myself, an interesting bit of history I suppose. Getting to said viewpoint was much harder than you'd think though, and definitely cost more than 1000 yen. 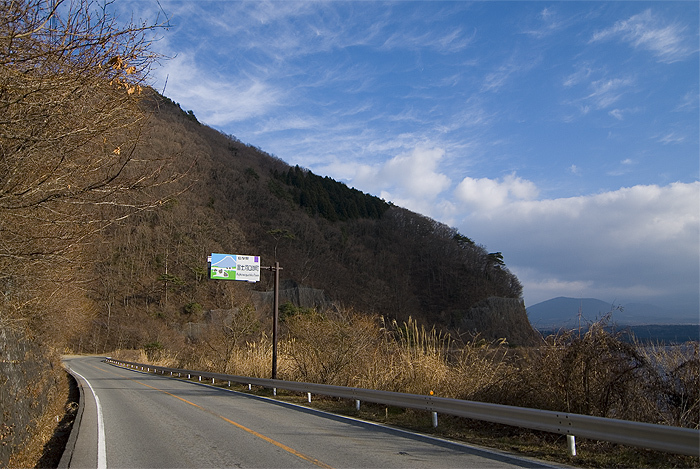 First of all, from the starting point of Kawaguchiko station, the bus going to lake Motosu costs about 1500 yen one way. Secondly, the bus stops on the east side of the lake and there is no bus service to the actual viewpoint. Thirdly and most disppointingly, there was no hiking trail to the viewpoint, so I had to walk on the main road to get there, about 90 minutes one way, on asphalt, with every car passing by giving me strange looks. I guess it's understandable though as it's not everyday in the Japanese countryside you see people, let alone a foreigner, walking along country roads. There were a fair number of tourists at the viewpoint, but they all took in the view from the highway rest stop. Myself, I went down the the quasi beachfront, and had a relaxing lunch alone among the trees. Still, I couldn't stay for too long as the temperature was only around 7 degrees. I had to get moving again to warm up. Clouds had rolled in and covered Mt. 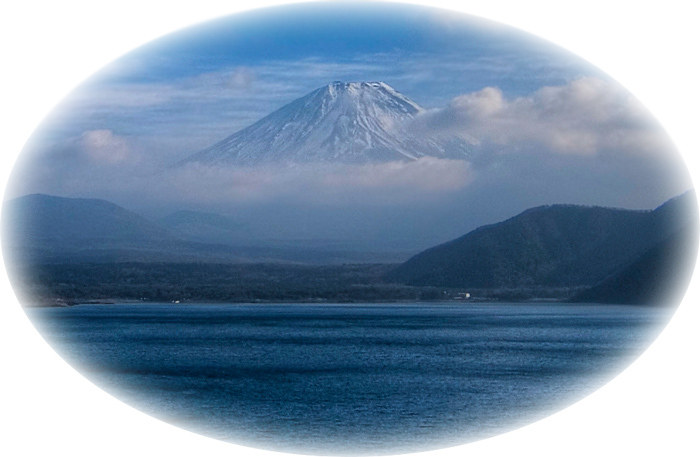 Fuji at this point, but the general haze of the day produced a nice sunbeam effect which I tried to capture. It actually looked much better in real life. If you look carefully you'll spot a lone fisherman on the beach as well. After retracing my steps on the road, I found a hiking trail about halfway down that branched off through the Aokigahara Forest, sometimes referred to as the 'Haunted Forest' as it's one of the most famous places in all of Japan for suicides. In the winter, without its dense canopy of leaves, the forest didn't have that oppressive feeling that I experienced the first time. Still, it's not exactly a relaxing place to hike mainly because its filled with crisscrossing and unmarked trails. I chose this and that fork on the path by instinct alone, and after maybe two hours of that, finally found myself at Lake Shoji, the smallest of the five lakes (see the map below). The sun was setting so from here, tired out, I took a bus back to my hotel. I woke up the next morning around 6am planning to get some scenic shots in the early morning light, but it was raining. 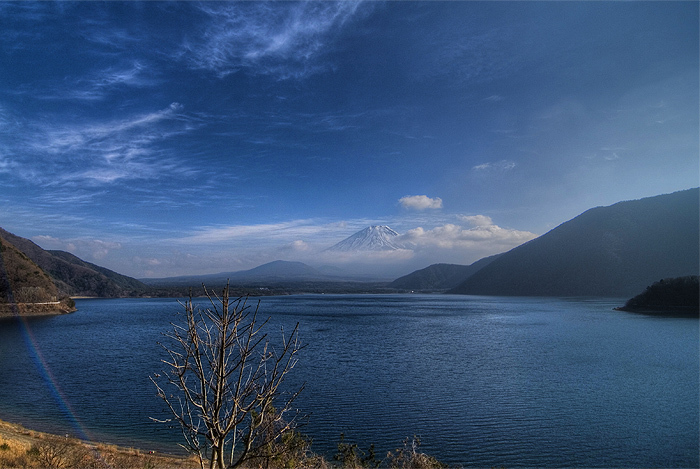 I went out anyway though, and headed down to the shore of lake Kawaguchi, the most built up of the 5 lakes. I didn't come here at all on my first trip, and skipped it yesterday as well due to its touristy nature, but since it was right next to my hotel and I didn't want to walk too much in the rain, I went down for a brief look, and with freezing cold hands and an umbrella I made this 180 degree panorama of lake Kawaguchi's western end. The rain did have one pleasant effect though, there wasn't another soul around. After a few more minutes I went back to the hotel to have breakfast and pray for the rain to stop. And it did! 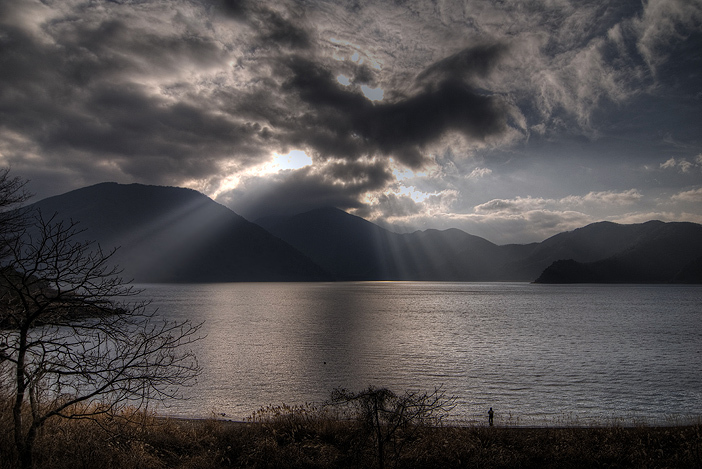 Only an hour later the sky looked like the picture below, a view of lake Kawaguchi's north shore.. I checked out of the hotel and set off on foot, not quite sure yet what my destination today would be. I ended up just going west along a walking path which pretty much completely surrounds lake Kawaguchi. 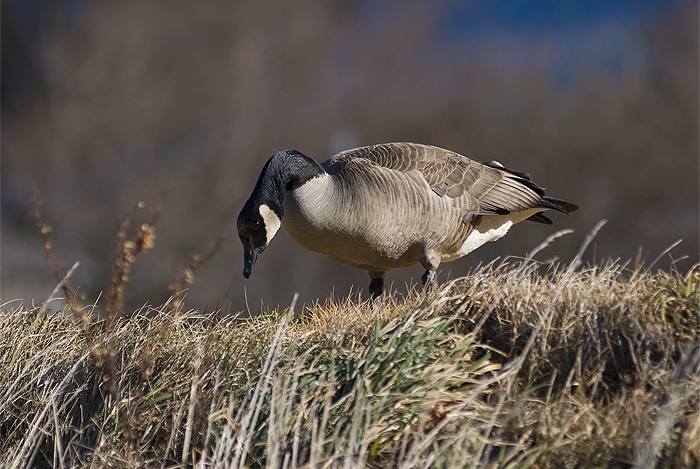 Along the way I ran into some Canada geese, and spent some time photographing them. 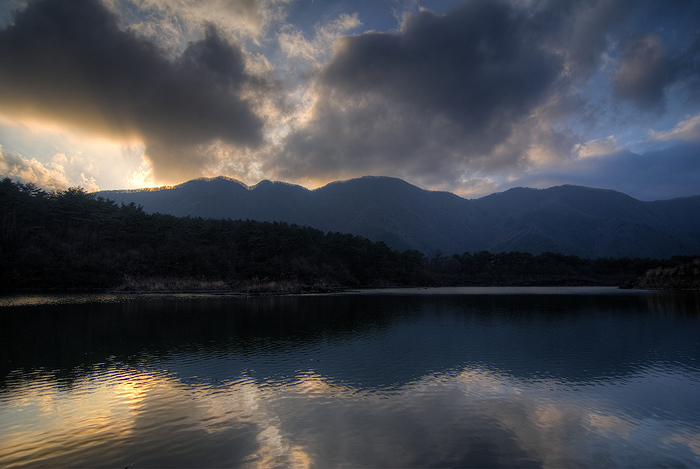 Once I reached the western end of the lake I decided to head back up the mountains to my old stomping grounds (if you will) of Gokodai, Sankodai and Kouyoudai, all of which overlook lake Sai, and which I visited last time I was here. The weather was sunny and cool, the air was clean and even down by the lake there was nobody around. I figured if there were so few people in the tourist zone, the mountain trails must be almost empty. In fact they were so empty that I hiked the whole trail (about 4 hours) and only passed one other person. For the rest of the time I was blissfully alone with only the trees, the birds and the wind. Without a doubt it was the best hiking experiene I've ever had in Japan so far. The above and below shots are taken from the huge 360 degree viewing area called Sankodai (three lakes stand), which, if there are no clouds, offers one of the best views of Mt. Fuji and the surrounding area I've ever seen. Last time I was here I had to share it with 200 high school kids, but this time it belonged to me. Even a 180 degree panoramic photo can't hope to convey the beauty and majesty of standing there, alone, in silence. Truly a magical place. If you go, make sure you go in low season, on a weekday. Trust me, it loses something when you have to share it with hordes of people. Why is the region called the five lakes area when there are only four? Good point. There are five actually, lake Yamanaka lies far to the southwest, and I'm actually not sure if it boasts anything the other four don't have. The sun sets early in the winter, so make sure you leave yourself enough light to get down the mountain safely, and don't forget to check the bus timetables before you head up! Out in the countryside you'll be lucky to get one bus per hour. 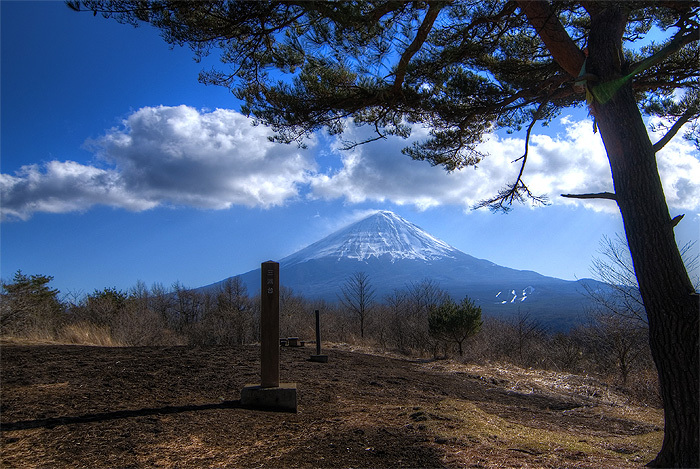 To get to the Fuji Five Lakes region, take a highway bus from Shinjuku station. It'll take about an hour and 50 minutes and cost you 1700 yen, much faster and cheaper than the trains! Safe hiking.